Big storms can often cause a lot of damage to property, including knocking down power lines and taking down trees. But occasionally an awesome moment can come out of devastation, and that’s exactly what happened when the local news was caught off guard by a dog on a lawn mower while filming a recent segment in Malakoff, Texas after a storm. It must be seen to be appreciated, so give it a watch, below. After a storm knocked down structures and generally wreaked havoc, KYTX Dallas reporter Andrea Martinez went to survey the damage in Malakoff, outside of the larger city. She showed viewers some of the damage before her news report was totally derailed by an adorable dog, who was sitting up and seemed ready to engage in some clean-up efforts. If you’ve never seen a dog on a lawn mower before, today is your day my friend. 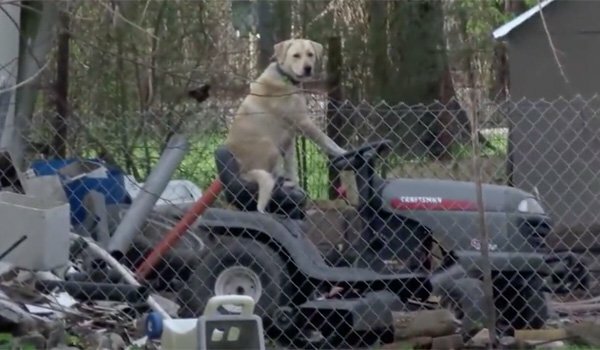 The image of the dog sitting on the riding lawn mower quickly went viral, and while some commenters on the thread seemed concerned about whether or not the dog was in an ok state, the team noted on the post that the dog was in a fenced in area and seemed to be alright. It's doubtful KYTX would have moved on if the dog had been in distress of any sort. Still, it wasn’t all great news. A lot of people were out of power in the area as of yesterday, and flooding occurred in some areas in the KYTX jurisdiction. Hopefully, people living near the storm damage are safe, and at least a wee bit uplifted thanks to the world’s cutest dog. If you’d like more cute dog moments, we’re totally not above giving them to you. Go ahead, watch the dog that stole a glove at a college softball game. Or even the dog and horse who are besties. Or check out the dogs who have used sad eyes to get out of trouble. You know you want to.